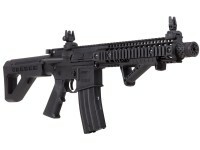 Engage targets in full-auto with the Crosman DPMS SBR CO2 Air Rifle! Based on the ultimate warfighter rifle the M4, the DPMS SBR (Short Barrel Rifle) gives shooters everything they want from a full-auto M4 adapted for maximum airgun fun. 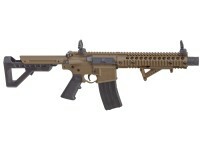 Officially licensed and stamped, the DPMS SBR slings blistering semi and full-auto repeating BB shots, fueled by two 12-gram CO2 cartridges housed in the 25rd magazine. Adjust your SBR to your preference with a 6-point adjustable rear stock and get a steady support from the removeable hand rest on the forend. The SBR’s quad-Weaver/Picatinny rails give you limitless opportunities for mounting flashlights, pistol grips, and lasers. Each package includes removable pop-up sights and the rear sight is adjustable. The fire-mode selector lets you choose between semi or fully-automatic shots at 430 fps. Things I liked: Accuracy, ability to add lights/lasers/etc FULL AUTO BABY!!! Things I would have changed: The ability to change stocks, add a ring for a single point sling. What others should know: Ok the main thing I want to say is I have read a lot of reviews saying the magazine loader is junk and boo hoo hoo.....well I dont know if they are trying to use some weird over sized BB or are just some 10 year old kid repeating what they have read? Or it may be they simply just have no idea how it use it I have fired my SBR over 3000 times every BB went through the speed loader flawlessly I am even able to load my Betetta 92 mags with it. Things I liked: Great looks, realistic weight and AR functions. So much fun to shoot, I added a red dot sight. I loaded BB's by hand which was quite easy. I'm collecting Social Security later this year so i'm no kid but older people can enjoy these too. My wife Donna Lynn loves shooting it too and we bust up plastic water bottles and other targets in my garage "Air Firearms Range". Thank you Crosman. Things I would have changed: Include an extra mag for maybe $30. Can you put any flash hider on it? 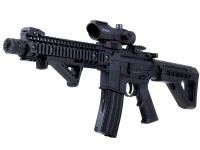 Does this have the same functions as the black dpms? And does it work well?